Waikiki Sunset #3112 - "WOW" Ocean Views! Plus A/C, WiFi, Pool, Parking, Close to beach! Sleeps 4. 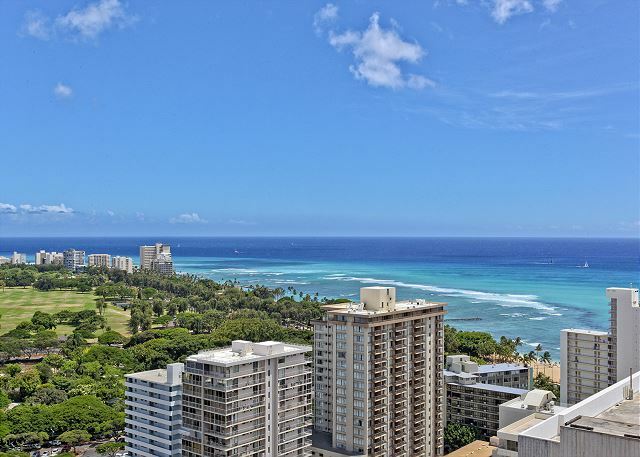 You’ll enjoy fabulous views overlooking the ocean, Diamond Head and Kapiolani Park by day and great sunsets and city lights at night from this 31st floor, one-bedroom condo with central AC (534 sq.ft. plus balcony/lanai). - Sliding door to balcony/lanai with incredible ocean and Diamond Head views! An on-site sundry store offers beach equipment rental. Laundry facilities on each floor; public transportation at corner. Just 10 minute walk to the best swimming and surfing beach in Waikiki, plus shops, restaurants, the Honolulu Zoo, Waikiki Aquarium, and Kapiolani Park! This non-smoking accommodation sleeps 4. Waikiki Sunset 3112 is a great place to stay. Very Clean and has everything needed for a wonderful stay. Thanks to Byron for meeting us and going over any questions we had. Aloha and mahalo for taking the time to post a 5 star review and recommendation of this fabulous condo. We're delighted you enjoyed your stay and had a relaxing trip! It makes our day to know our dedicated staff was able to make your vacation from start to finish a wonderful experience. We look forward to welcoming you back in the near future. In general, we are satisfied to stay in this room, especially excellent overview and nice location. One drawback was old building. One of the four elevator was under maintenance which caused crowded elevator room. In addition, we could not use water for one day due to plumbing work. Mahalo, for sharing your comments about your recent stay. 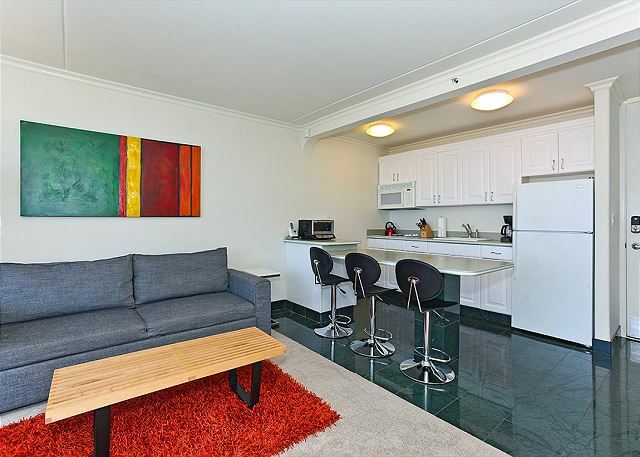 We are pleased that you appreciated the views and convenient location of this great condo. We were sorry to hear of the problems you experienced with the building and the elevators. We truly apologize for any inconvenience this may have caused and understand how frustrating it can be when things don’t turn out as planned. Your vacation rental is privately owned and the building maintenance are not associated with Captain Cook Resorts. Waikiki Sunset is in the process of future renovations of the building itself and we are happy to say there will be huge improvements. We hope you will continue to keep us in mind for future visits. 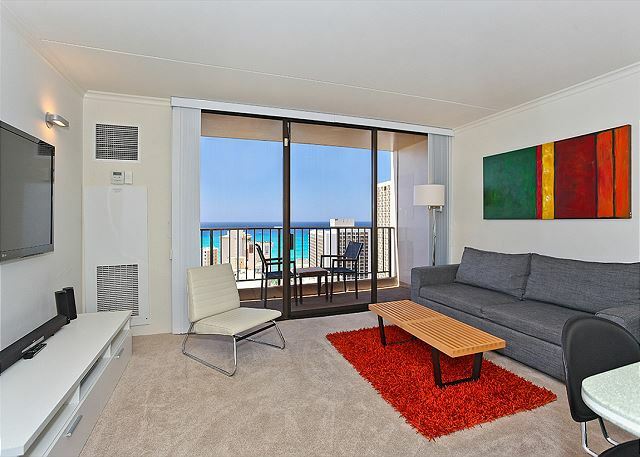 Great place to stay in Waikiki, the condo is clean and comfortable with a nice view. We even got a late checkout because our flight was at 8pm. Highly recommended. Lovely rental fully supplied with beach chairs, beach towels, snorkeling gear, etc as well as a kitchen for basic meals (if you want to cook). King size bed was nice. Close proximity to the beach, zoo and Diamond head. We enjoyed our stay at this condo. Mahalo for taking the time to post a review and recommendation! We are so glad you enjoyed your stay in this great condo! We appreciate the feedback and will look forward to your next visit! 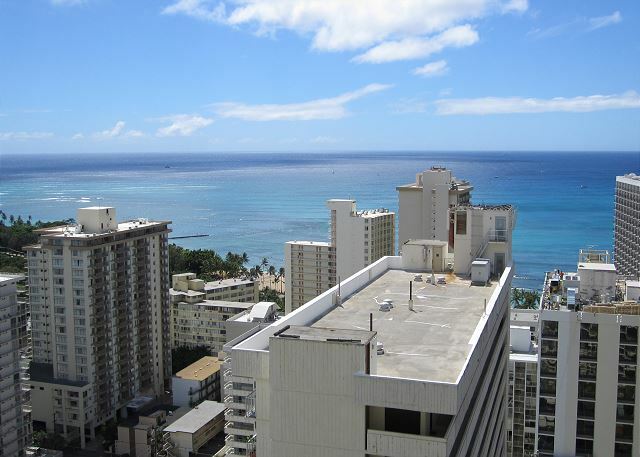 Condo very nice, comfortable, good location, fantastic view of ocean and Diamond Head. Would definitely stay here again. Mahalo for the great review! So glad to hear you enjoyed your stay in this great condo! We look forward to your next visit! This was as close to perfect as it gets. The crew was extremely helpful upon our arrival and we were promptly checked in and in our room. The view from the room was absolutely breathtaking...being able to see Diamondhead and the beautiful water would never get old. When you combine the above with walking distance to the zoo, shops, was an almost perfect experience. The room itself was perfect for our family and it was very clean. The wifi worked well, the kitchen was stocked with supplies, and the beds were comfy. That's a small complaint, we would 110% stay here again(and planning on it). We highly recommend this location! Mahalo for taking the time to send such a wonderful detailed review and recommendation! We are delighted the you found your stay perfect! We are so pleased that you appreciated the convenient location and incredible views of this amazing condo! Mahalo for choosing to stay with Captain Cook Resorts and I will pass your positive feedback on to the team! Hope to see you on your next visit! Comfortable. Great knives and good set of pots and pans which are sometimes a rarity in a rental. Lots of towels including beach towels. Mahalo, for the wonderful review and recommendation! We are please you appreciated the view, kitchenware and towels. We are dedicated to offering great accommodations and service, and we're so glad your visit was enjoyable. We hope you are able to plan a return trip soon! Mahalo, for the wonderful review and recommendation! Hope you are able to plan a return trip soon! Excellent location with an amazing ocean and diamond head view. 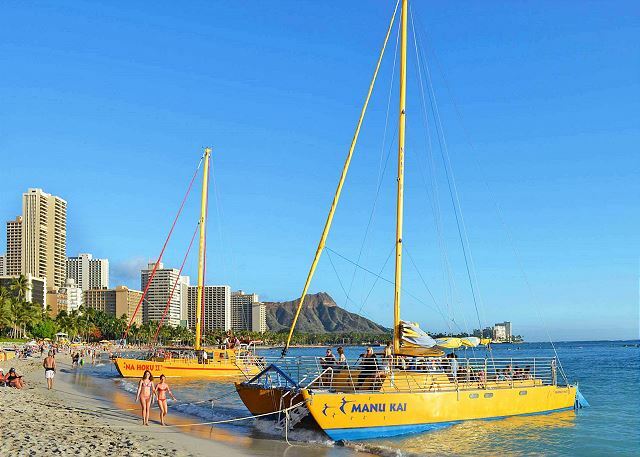 The rental provided everything you need for a day at Waikiki Beach, very easy check-in and checkout. Compared to hotels in the area, this value is hard to beat. Mahalo, for the lovely review! We're so glad you enjoyed your stay and pleased that you appreicated the location and ocean views of this fabulous condo! We look forward to seeing you on your next visit! We had a great stay in the apartment. 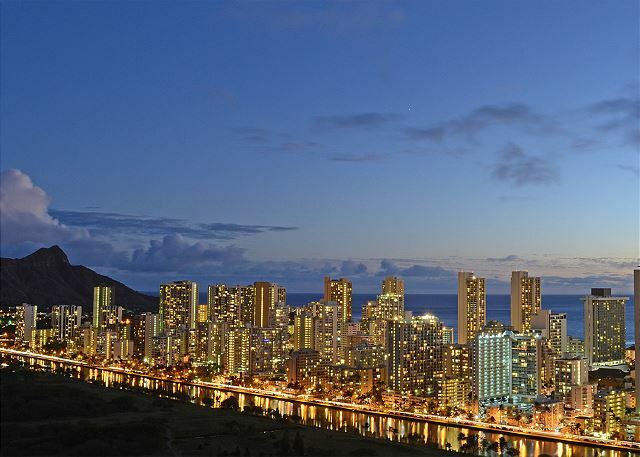 It has an amazing view of the ocean and was perfect as a base in waikiki. We would definitely comeback to this apartment. Mahalo, for the lovely review and congratulations! We're so glad you enjoyed your stay and pleased that you appreciated the amazing ocean views of this fabulous condo! We look forward to seeing you on your next visit! P.S. We think Byron is great to work with too! 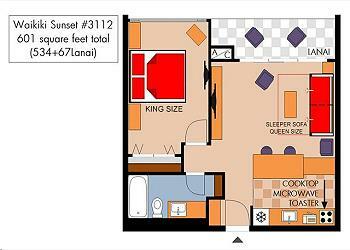 This accommodation has everything that could be required in a convenient location. If we were to return we would definitely stay at this property again. We return to the islands every 3 months and stay at this unit because for 2 people (Mom and I) is it just the right size and offers 2 separate sleeping areas. 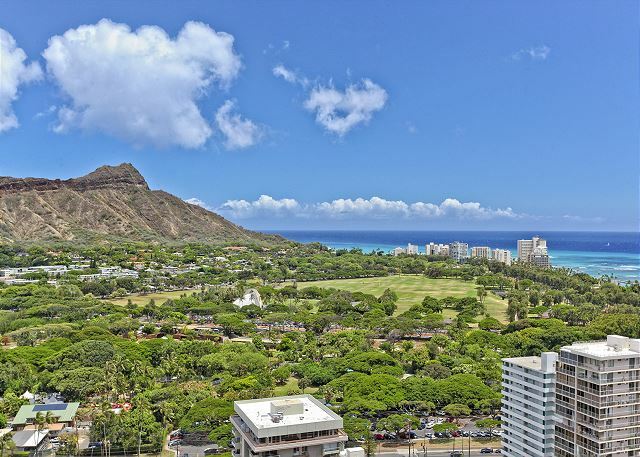 The views towards Diamond Head and Kapiolani Park are unobstructed with awesome views of Waikiki Beach and ocean. Also, because it is just one block away from the beach, it is quieter and less busy. Byron and Captain Cook ALWAYS accomodate our needs and make sure we are comfortable. Mahalo for choosing to stay with Captain Cook Resorts and the great review and recommendation, welcome back! It’s always encouraging when customers acknowledge the good work of our team. We look forward to seeing you on your next visit. We could see ocean, Kapiolani Park and Diamond Head. It was perfect. Room was renovated and Bed are new. Toilet has some problem and water was running and we have to manually stop the water. I think it would be repaired now. Overall impression is very good. Mahalo for the review and reccomendation! Glad to hear you enjoyed the fantastic views of this wonderful condo. Thank you for alerting us to the toilet issue, we will pass this on to your property manager for resolution. In the future, please remember that the property manager is there to resolve any issues that may arise during your stay. We look forward to seeing you on your next visit! L'appartement était bien localisé à Honolulu. Mahalo para la revisión y recomendación. Feliz que te gustó la ubicación de este gran condominio y esperamos su próxima visita. We were a family of 4 (Mum Dad 2 teenage sons) who holidayed for 10 days in Waikiki Sunset #3112. We were thrilled with the property, amenities, inclusions, proximity and its facilities. We hired bikes for entire stay and a car for 4 days. Free secured parking for cars and bikes, free wifi. The condo was well presented, clean, well-maintained and perfect for our family. It was spacious and exactly as presented in the pictures. We took 2 DB blow-up beds and linen and left the lounge for seating. Despite this it was still roomy enough. Furnishings were comfortable, as was the new King size bed. Byron was extremely helpful on our arrival and made us very welcome. Mahalo Byron. We were fortunate not to have needed to contact him during our stay as we had no issues that needed addressing. The complex was attended 24 hours a day with hotel and security staff. We researched extensively prior to our arrival and ticked every destination, delicacy and activity. It was a dream holiday with an ideal home base. We had the bestest time ever. Mahalo to Hawaii and its people. It makes our day to read such an enthusiastic review, Neil - mahalo! Happy to have provided all of the needs you required for a wonderful family vacation! It's what we're here for! We look forward to your next visit! P.S. We think Byron is super to work with, too! This condo faces Waikiki with views of the water, Diamond Head and Kapiolani has stunning views the minute you open the door...every time! Clean, we'll maintained and a good supply of beach towels, chairs, umbrellas. It could use an in suite dishwasher or washer dryer but with just 2 of us, it was fine. With 4 people, perhaps, it might be a bit of a problem, since who wants to do dishes on holiday? Nice pool, barbecues and tennis courts. Loved the location and the condo. We will be back! So glad to hear you enjoyed your stay - we are dedicated to offering great accommodations and service, we will pass your feedback on to the owner and our team. We look forward to your next visit. Nicely updated unit with wonderful views. Well stocked kitchen Meaning lots of pots and pans, flat wear, glasses etc but nothing but S & P in cupboard not even coffee so b aware. Clean and neat unit but I did have to ask for a broom which was brought to me by property mgr. it had a very comfortable bed and plenty of beach Towels and beach chairs. Loved that! I would like to see some instructions on working DVD PLAYER AND IPOD DOCK. I would definitely Rent it again. Mahalo for the wonderful review, Sharon. We're so glad you enjoyed your stay! Hope you're able to plan a return trip soon! Mahalo, Sharon, for taking the time to share your recent experience at Waikiki Sunset 3112! It's always great to get this kind of feedback - we're so glad you enjoyed your stay! We look forward to having you back for your next vacation! Great location with a great view! Our stay was absolutely amazing! The condo was exactly how it was in the photos. We loved that beach umbrellas, chairs, and towels were provided for use during our stay. Would definitely stay here again! Mahalo, Mindy, for taking the time to share your recent experience at Waikiki Sunset #3112! It's always great to get this kind of feedback - we're so glad you enjoyed your stay! We look forward to seeing you on your next visit! the view is amazing, and they have all the snorkeling, beach stuff that you can use!! the only thing i'm not satisfied is the smell in this room, but it will become much better after you turn on AC for 1 hour~! Mahalo for the great review, Yu-Chen. Glad you enjoyed your stay - that view really IS amazing, isn't it?! As to the lingering odor... having never dealt with this issue before, we can only assume it had to do with cooking from the previous guest. Our apologies - but glad to hear it cleared up within an hour! Visiting every 3 months and after staying in the Penthouse unit, we thought we'd be a little let down downsizing. 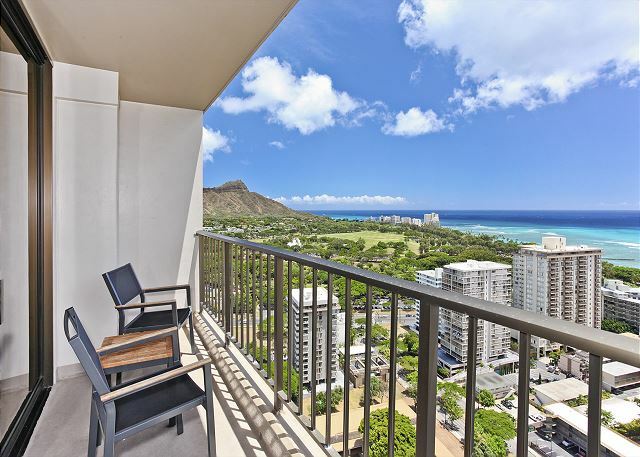 But this 1 bedroom unit provided an atmosphere to enjoy the georgous views of Waikiki, Kapiolani Park and Diamond head from the lanai. Byron was once again on top of things and problem solved anything that came up during the stay. Thank you Byron...we already consider you Ohana. See you all again in December!!! Mahalo for the great review, Kim! We're so appreciate the feedback and compliments about Byron - he's such a great addition to the Captain Cook Resorts team! See you in December! I was very impressed with the professional service of Captain Cook Resorts from booking to check-out. The were courteous and helpful during all of my interactions. The condo was clean, modern and exceeded my expectations. It was great having the extra space as a family of 3. The building itself is a little dated, but this wasn't a concern to us. It was a very quick walk to the beach. I would happily book this Condo again, and recommend it to family and friends. Mahalo, Terran! We appreciate the feedback and recommendation to your friends and family. We look forward to your next visit! Mahalo, AJ! Glad we could host your "best time ever!" Great vacation - good beach time, good museum visits, good family time, and good accommodations in convenient location. Can't say enough good things about our experience here! 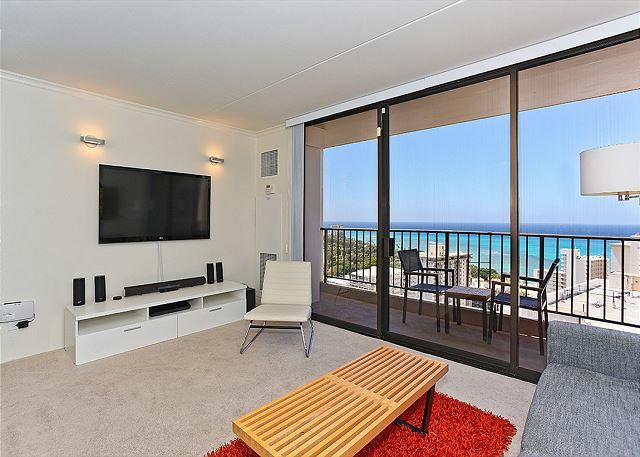 We love the contemporary style and the magnificent views of the beach and Diamond Head right off the balcony! It had everything we needed and more from beach equipment to a fully stocked kitchen. Everything was clean and well-maintained. Byron was super helpful in giving us an overview of the property and giving us suggestions on activities and restaurants. We took him up on several of his ideas and we loved Lulus for dinner and drinks. Location was ideal and we were able to walk to the beach or to dine out. If we are to return, and hopefully we are, we would definitely stay here again or recommend to a friend! What a great review, Courtney! Mahalo! It's great to hear that our efforts to exceed the expectations of our guests is paying off! We hope you ARE able to return - soon! One block from the beach with an incredible view from both the bedroom and the living room. Very well equipped kitchen and also some beach gear like towels, chairs etc. Nice and quiet at night on the 31:st floor. Mahalo, Yohan, for the great review! I'll bet you'll be happily dreaming about the view from 3112 for years to come! Hope you can plan a return visit soon! Cannot beat the location, great views. Management was very helpful, timely and responded to issues. The john had issues, but were resolved quickly. The couch was a little uncomfortable, especially for sleeping. Those were the only issues and I would recommend this rental unit. My wife and I stayed for five days. We had a fine view and a clean room. Property manager was much courteous. My husband and I just returned from a week's stay at this condo. It was an awesome unit. I would highly recommend it to anyone. Thanks. Mahalo, Margaret, we appreciate the feedback! Good, clean, well located condo, with all the necessary equipment. Parking facility was very good and Captain Cook personnel were very helpful. The bed is comfortable and the two flat screen TVs were very enjoyable, Wifi in condo is fast and always available. The only improvement that should be made is to replace the living room sofa. It is very uncomfortable and had a bad odor to it. Mahalo for the feedback, Bill! We're glad you enjoyed your stay. Thanks also for the heads-up on the sofa; we'll have it professionally cleaned right away! Fabulous view, bright, clean and well equipped. Location is handy to the beach and any activities we were doing. 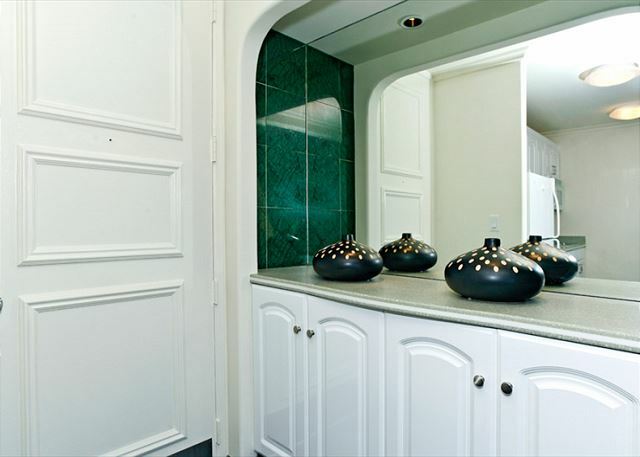 Building hallways were dated but the condo was renovated and very pleasant. Thanks for the great review, Rosalynne! Hope you're able to visit again soon! The management was very helpful, met us on time for checkin, and gave us all the info needed. They were extremely helpful in accomodating a late check out as our return flight was 11:30PM. The view from this property was excellent and proximity to restuarants and beach was great. Would recomend this condo to friends and return as well. Mahalo, Jeremy, for the wonderful review and recommendation. We hope to see you again soon! I spent 13 nights in Waikiki Sunset 3112. It was a wonderful adventure. The property was exactly as the description and pictures promised. There was more than enough kitchen and bath amenities, and there was also beach equipment available. This is a perfect place to spend time and it is close enough to the beach strip to provide plenty of dining and shopping options. I would definitely consider renting this unit again if I every return to Oahu. The property manager, Byron, went out of his way to make sure everything was as it should be, and he answered any questions I had. He was very accommodating and thorough. He is a great asset to the operation. I also recommend Captain Cook Resorts. Mahalo, Ronald, for the great review and recommendation! We appreciate it! We'll be sure to pass your feedback on to your property manager, Byron. Like you said, he's a real asset to the Captain Cook Resorts team! We loved our stay in this gorgeous apartment! The apartment was nicely decorated and the view was amazing! Although the toilet was clogged when we arrived, it didn't take long until someone came to solve the problem. The apartment was clean, the free parking convenient and the location was just a short walk from the beach. We definitely would recommend the place to everyone!! Mahalo for the great review, Tarek! Hope you can plan a return visit soon! Over the years we have visited all of the other islands but this was our first visit to Oahu. We have rented lots of condos in the past and would have to rate the over all experience as EXCELLENT. Mahalo for the great review, Richard! We're happy you enjoyed your stay and hope you can return again some day! Mahalo! We look forward to hosting you on your next trip! We (a family with two teen girls from Germany) stayed in the condo for 8 nights in September 2015. The condo was absolutely fabulous and we enjoyed every minute ! It's a five minute walk to Waikiki Beach, parking was very comfortable and easy. The view from the unit is absolutely breath-taking. If we ever return to Honululu again, this will definitely be our place to stay ! Mahalo for making our vacation perfect ! Mahalo, Birgit! Sounds like you found the perfect fit with this condo! So glad your family enjoyed their stay. We'll look forward to the day you're able to plan a return trip. I stayed 6 days in this room with my family. I have two children, so the location is better for us. 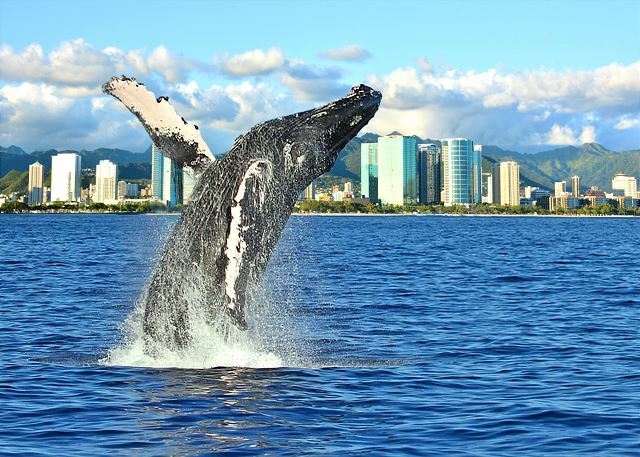 We can go to Honolulu zoo and Waikiki beach by walk. We had a minor trouble on water leakage from a disposer because of old equipment. Since our manager was kind and supported quickly, I was able to enjoy our trip. Furniture was the fashionable. Also minimum of livingwares were stored, it was convenient. Daumen hoch für diese Wohnung. Sie ist **** und modern eingerichtet und hat durchaus den Standart den wir uns in Europa gewöhnt sind. Die Lage ist super, da der Beach mit vielen Restaurants zu Fuss erreichbar ist. Ein grosses Lob auch an Byron welcher uns für Fragen und bei Anliegen stets kompetent zur Seite Stand. Buchungsprozess via Kreditkarte konnte ohne Probleme aus der Schweiz erledigt werden. A perfect place for families :)We had a great time! Mahalo für die Wahl Captain Cook Resorts und die grosse prüfung und auf empfehlung! Wir sind so froh, dass sie ihren besuch war angenehm und freuen uns auf ein wiedersehen. Wir setzen das feedback auf ihre immobilie manager, Byron übergeben; er ist eine echte bereicherung für das Captain Cook Resorts Team! This vacation rental was perfect for our stay on Hawaii! The panoramic view is amazing!! It was a very short walking distance to the beach and shops! The rental was clean and had all amenities we needed for our stay. The price was very good for the location and view! I would love to stay here again!! So glad you enjoyed your stay! Will bet that view stays with you forever! Hope you can come and visit us again! Great condo right by the beach! Mahalo for the positive comments and recommendation! Thanks for the tip about the great French toast at LuLu's! You'll now find that on the featured restaurants on the smartphone app! We look forward to seeing you on your next visit! Mahalo for choosing to stay with Captain Cook Resorts and the great review and recommendation! We're so glad your visit was enjoyable! Situated in the Aston Waikiki Sunset Hotel, we found the facilities and front desk staff excellent, even though the condo is a private unit. Waikiki can be quite noisy, but this 31st floor unit is not (except for the frequent and inevitable emergency vehicles, day and night.) The kitchen was missing a few essentials for cooking full meals and I did miss a full oven for baking. Sadly, the beds are not comfortable and could be improved with a memory-foam top on the mattress. Our property Manager, Byron responded to the few calls we found necessary and was very pleasant and helpful. Mahalo for the positive comments and recommendation! We work hard to offer great accommodations and service, and we're so glad your stay was enjoyable. Bed comfort is highly subjective. Looking back over a year's worth of reviews, no one else has mentioned the beds being uncomfortable. Next time, please let us know and we'll see about getting you a foam topper during your stay. We look forward to seeing you on your next visit! Despite the unit not being ready upon our arrival (due to previous renter not leaving on time), we had a great stay. Byron, the manager, was outstanding. He met with us right on schedule and took great care of us. The unit has a great view and it’s very comfortable. It’s just few min walk to the beach and restaurants. This was the first time we have used Captain Cook Resorts Company and they left a memorable impression. Mahalo for the positive comments and recommendation! It’s always encouraging when customers acknowledge the good work of our team. We look forward to your next visit! After extensive research we chose this place and so happy we did! We are a family of four with 2 boys. Everything about the unit was perfect. Convenient location, all conveniences to feel at home away from home. Management staff were very welcoming and very pleasant to interact! Thank you very much for the positive comments and recommendation! We work hard to offer great accommodations and service, and we're so glad your family enjoyed their stay! We look forward to seeing you on your next visit! Our family really enjoyed our stay here, staff were super accommodating especially when we locked ourselves out! Central location, made walking back and forth to the beach very easy. Loved sitting on deck taking in Diamond Head, the ocean and the zoo just a block away! Mahalo for the great review! We hope you're able to plan another visit soon! Expectations of condo and location were met, condo was very clean and had all of the necessities. was a great experience and would stay again. Mahalo for the wonderful review! We're so glad you enjoyed this condo! We look forward to your next visit! Great everything! Totally coming back to stay at the same room!! we enjoyed the time we spent the condo. everyone was very helpful. the location was excellent. The Apt is in a great location just a couple of blocks from the beach, you can be at the shops in two mins. Great views from the balcony and the pictures on the website are a true representation of what you get. Loved the location of the condo..close to the beach and the park for running. Everything was great except the couch is not really workable as a bed. Mahalo for the positive comments and recommendation! We work hard to offer great accommodations and service, and we're so glad your stay was enjoyable. A sleeper sofa has replaced the sofa beds that were previously in this unit (early 2015). We look forward to seeing you on your next visit! Overall, our experience was great. It was very easy to arrange the rental and Captain Cook kept us updated on exactly what we needed to do and when. Everyone we dealt with was friendly and helpful. We especially liked the mobile app that we received that contained all the information we needed about our rental, including a location map and things to do in the area. Overall, we were very satisfied with our condo rental. The view from the condo was excellent! 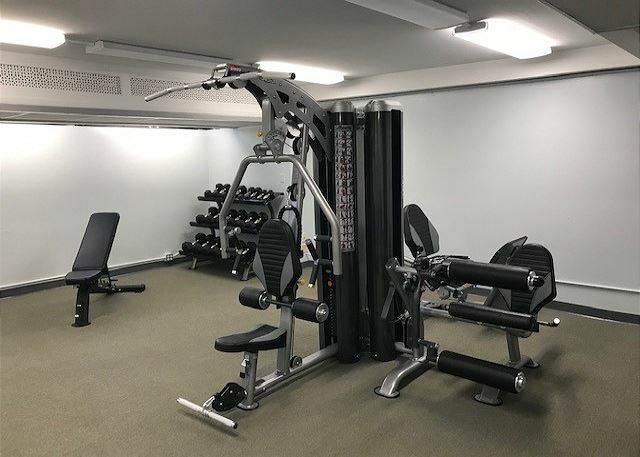 The unit was well maintained...looked new and fresh. It was tastefully furnished. The furniture was in very good condition. The condo was well equipted with appliances, utensils, dishes etc. The included free parking, free wifi and local and interstate phonecalls were a tremendous plus! Main complaints and reason for only 4 stars in first two catagories below: we thought the couch was very uncomfortable, and I thought the mattress was very uncomfortable, although, it did not bother my husband very much. We would rent the condo again. No one should ever stay in a hotel! This place is the best! Couldn't be happier with the experience!!!! So beautiful, clean, friendly, amazing! My stay was for two weeks and I was looking for a place with a view and near the beach and near all the action in Waikiki. This unit is very close to the water and has a nice view from the 31st floor balcony when you want to escape all the tourist down below. It was nice to sit out and watch the war ships doing exercises with my binoculars. Safeway store, shops, bars and the mall were all within walking distance. Parking is very convenient with 24 hour attendant. I had a rental car in order to explore the island. Laundry room on the same floor was convenient for my two week stay. The wifi was fast enough to run my Roku3 so I watched a few NHL games. I booked one tour with the lobby folks and the van picked me up right in front of the building for a tour of the Arizona Memorial and the Battleship Missouri and they dropped me off back at the hotel after. I would stay again the next time I travel to Waikiki. I was in Waikiki for two weeks for my sons wedding.I invited several family and friends up to the condo, and everybody commented on how much nicer and spacious it was as compared to the hotels they were staying at in the same area.I loved the modern decor and the condo had absolutly everything I needed from coffee machine to beach towels, and with killer view. Sometimes when we travel from home I get home sick cuz I miss my bed or can't prepare the foods I'm used to. Not here--The bed was so comfy, the room super clean and not cluttered. The kitchen had wonderful countertops and a sitting area where we could enjoy our home cooked meals with a spectacular view(shop @ Safeway up the street). I have used VRBO many times before but never felt compelled to write a review. This condo was so awesome I had to say something. My husband and I stayed with no kids and it was perfect. The quite side of Waikiki has become our favorite, less traffic and noise, easy walk to the beach and a lovely view of diamond head. The futon that has been mentioned in other reviews isn't real comfortable to sit on, but the white chair was so cool I want to get one. The only one thing that wasn't working was the outlet in the bathroom, I had to blow dry my hair in the hallway. I'm sure they will have that fixed soon. Thanks for a wonderful stay!!! I recently returned to Waikiki after 40 years. My stay at the condo in Waikiki was truly amazing. Great view, nice furnishings,everything you could want in the kitchen and supplies were there even beach chairs, beach towels, and a rice cooker. Home away from home. Close to beach - not noisy - felt secure and safe. Would recommend using Captain Cook Real Estate and VRBO. clean, great view, and nice kitchen! The property manager Byron was very friendly and helpful! Even though the sofa bed was not so comfortable, the property's general condition was good. We had a great time staying there! We'd love to stay there again!! It was great experience. Service was great and property was clean. Most of all we like the view. This was listed as a great place to stay for 4 people.... the sofa bed was a futon that was extremely hard ... it was so bad that the 13 and 10 year old children refused to sleep on it. otherwise it was awesome, so if there are only two people in your party.... AWESOME PLACE !!! The view was really nice,and the parking was convenient. Great elevators. Not the best pool and there is no hot tub, however the sister Aston property (Banyon)across the street has all that, and its not a problem to use. The property manager Byron was super helpful and a pleasure to deal with, and even picked up some additional stainless steel pots as I prefer not to use non-stick. There is no oven in the unit, however there is a decent toaster-oven. Checking in was easy and Byron was helpful and professional. Property is nicely renovated and the pictures are 100% accurate and the view is spectacular. It also saved us a lot of money with the free parking. Location is convenient as it is only 2 mins walk from an ABC store, 5 mins walk from the Waikiki Beach, and 5 mins drive from a Safeway. In additions, nice 3d TV with full stereo set and nice appliances. This was the perfect place to call HOME on this trip. The free parking is what attracted me to the place but I got so much more. The pictures were exactly what the apt looked like. All the appliances and utensils that we would need - and more! This was renovated with a comfortable sleeper couch and a 3D HD TV .... the view was perfect and location was wonderful. I would highly recommend this condo. The only "downfall" (if you want to call it that) was that the linens and towels were not replaced and we had to wash them our selves (we stayed a week). And we had to go out and buy toilet paper lol . Since we are not a hotel we don't provide daily room service but there is a laundry room on every floor. And for guests who are just too busy having fun to bother with doing any laundry or cleaning we can arrange service in advance for an added fee. And if guests run out of items that we provide initailly, like toilet paper, there is a mini mart right in the building. Our recent stay at Waikiki Sunset #3112 was just wonderful, even more than I had ever hoped for. From making reservation, to arriving at the property with Byron greeting us, and throughout the entire stay (1 week in August 2012), we have absolutely nothing to complain about. The place was exceptionally clean (very important to me). The view from the balcony and bedroom window was simply amasing. The living room even had a 3-D LED TV. The only thing I wish the property had was a dishwasher so we could spend even more time on the beach or sightseeing. Byron professional and very helpful. The unit immaculate, clean and well equipped. Definitely would recommend to a friend.